This poor dog was found by Indian organization Animal Aid Unlimited, just in time. 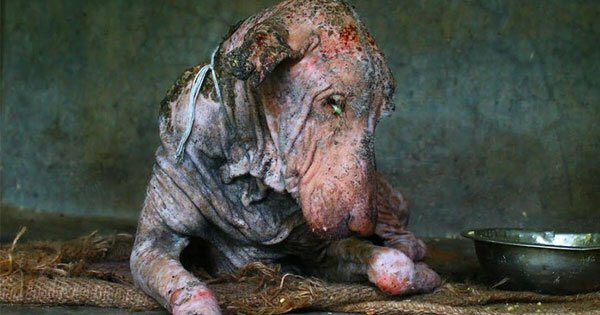 It was suffering from mange, starvation, and anxiety. Animal Aid Unlimited fed him and hooked him up to an IV. They treated the skin infections, which were healed in just ten days. In the following weeks, it’s as if he became a whole new dog. Two months after his rescue he is happy and healthy with a loving place to call home. Here are a few pictures of his journey to recovery. Thank God for shelters that take the time to heal these amazing animals. The poor guy was found on the side of the road in Udaipur, India. The shelter took him in and fought hard to save him. At first he was afraid of people. He obviously hadn’t been touched in a long time. After weeks of treatment his skin healed, he became accepting of the human touch and he started to get a personality.